One thing missing in this explanation is that the Jackson Estate still retains the Mijac music catalog that includes all of Michael’s music which has a high value, upwards of $100 million. In addition, the estate has a 10% interest in EMI music publishing which is valued at $2.2 billion plus making the estate’s share around $220 million. That is still a very healthy stake in music publishing. While selling the Sony/ATV catalog is unfortunate, diversifying the assets of the estate could be a very wise business decision . Buying the entire catalog would, in essence, have put the estate’s eggs all in one basket. Based on what I have read over the last couple of years, the estate only claimed personal debt was clear. They have clearly stated that the $250 million loan on the catalog had been renegotiated to a more favorable interest rate. Contrary to fan belief, the estate never lied about this. There is a lot of bad information out there regarding the financial dealings of the Estate. Emotional reaction is okay but too much fact is ignored. I am sorry to see that. Even your piece alludes to pro-estate and anti-estate. There should really not be sides, only recognition of fact. Too many people don’t understand the facts, so base their opinion on emotion. It feels like an uphill battle to have a reasonable discussion about it. We have fought a battle for years in getting people to understand facts about Michael vs media controlled negative messages about Michael. It is discouraging that we can’t have reasonable discussions. Just because some of us understand the business aspect doesn’t mean that we are estate employees, an accusation thrown out too quickly and too often. Yes, I am aware that the estate still maintains those holdings. I think what many fear now, which is an understandable concern, is just how secure those remaining assets are. But for now, at least, the estate still holds control of them and that is good. That is a good point made about the $250 million loan on the catalog which is well taken. I certainly don’t wish to contribute to the lack of reasonable discussion on the issue. That is why I wanted to get past all of the pro and anti estate sentiments to look at the facts, including how the trigger clause came to be in the first place. Still, it is an emotional subject so I guess it’s kind of hard to leave emotion out of it completely. But I get what you’re saying, which is why the door to civil discussion is never closed here. Very balanced article thank you. May be we could also take into account the millions that Michael would have generated in the course of the ‘This Is It’ tour had he lived on. May be he would gave entered into fresh negotiations with Sony regarding the catalogue overriding the terms and conditiobs of 2006. Who knows. I believe this was always his ultimate goal, maybe not necessarily from TII but I think he always believed that eventually he would be in a position to renegotiate those terms. Raven, I have seen fans say that the Estate claimed in 2012 that all debts were paid many times on social media and on forums in the past days but it’s just not true. So there is the answer as to whose debts they were. They were MJ’s and no one said ALL the debts were paid by 2012, only all personal debts, but the same article also noted that this business debt on Sony/ATV still exists. BTW, how much Sony/ATV generated for the Estate is an interesting issue. People look at the revenue which is $600 million a year and from that they imagine that it generated profit in the $100 millions. Well, it did not according to accounting documents and the leaked Sony e-mails in 2014. The profit is surprisingly small. By the time they pay the artists around $84 million remains of that $600 million. Then there are costs and at the end both Sony and the Estate got $23 million each from it, acc. to the leaked Sony documents. Acc. to the Estate’s last accounting they got around $17 million a year from the Sony/ATV catalogue (the difference between the $23 million vs. $17 million may be gross vs. net) and all of it immediately went back to paying the debt. So basically it created zero profit for the Estate. Interesting to note that MiJac – relatively speaking – is a LOT better business. Although it only contains about 1000 songs (vs. Sony/ATV’s over 2 million) it made $12 million for the Estate acc. to the last accounting. And it doesn’t have debts to pay. There are several factors why that is so: it is mainly MJ’s music, so the Estate does not have to pay out as many other artists and songwriters as Sony/ATV. They don’t only get the income for publishing, but also for the performer and in most cases songwriter as well. Also MiJac has a lot less administrative costs. And Sony/ATV itself has its own debts on the catalogue (not only MJ had debts towards them) that they too have to pay. And of course, we as fans, can take pride in the fact that MJ’s music is still a strong seller both in the record stores and on streaming services. When selling the catalogue, the choice for the Estate wasn’t between just keeping it or selling it. Acc. to the articles it was between either selling their own half or buying Sony’s due to a so called shotgun clause in the contract between MJ and Sony. So basically the choice was between getting all debts paid at once and getting $750 million or acquiring another $750 million debt additionally to the already existing $250 million. There may be several decades until the Estate could pay back that much debt and before the catalogue could start producing genuine profit for them. Or they can get debt-free, take the money and put it in other investments that will produce profit all along. Considering that, from a strictly financial POV to me the choice seems like a no-brainer, to be honest. Now, I have seen arguments like “if it’s worth for Sony to buy it why isn’t it worth for the Estate”? Well, the Estate and Sony aren’t in the same position as business entities. I am sure Sony bought it because they expect it to do well (although they weren’t quite sure about the catalogue’s potential in the leaked e-mails in 2014, they actually contemplated selling it), but Sony is a huge multinational company with billions of dollars of profit a year, for which another $750 million loan is not as big of a burden as for an Estate. They also have many legs to stand on if this business does not turn out how they expect. For the Estate it would be putting all their financial resources into this one buisness and what if it doesn’t work out? The music industry is kind of a questionmark right now. 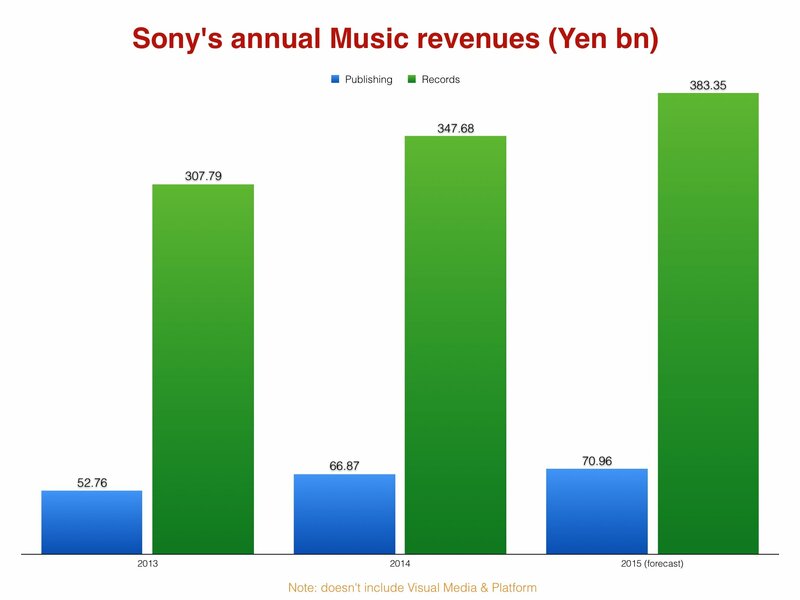 Sony obviously has hopes for the streaming business, but records don’t sell as they used to any more. Streaming may indeed prove to be big business, but what if not? Sony can take that risk, an Estate cannot and should not IMO. Also, don’t forget that Sony already has all the infrastructure to market these rights (record company, movie companies, huge administration etc.). The Estate does not have these means. Building some of that up would cost additional money. So putting aside the emotional element, to me the decision makes sense. I know it meant a lot to MJ, but he is gone, so to me it does not have as much significance any more. It’s just an investment that can be replaced with another investment. MiJac is a different issue. That’s MJ’s own music. That should remain forever in the possession of his heirs. I wondered about this, also, because again if we look at this as a situation where one party or the other has to buy out, who was obviously in the better position to do so? On the estate’s end it would have meant pouring all of the resources into this one basket. Do I believe Michael himself would have fought tooth and nail to keep it? Yes. But who knows at what personal and financial cost? (He did this for years, which is a big reason why his finances were in the shape they were in by 2009). So I agree we do have to look at this from many perspectives, not just the emotional one that obviously cringes at the thought of Michael’s ultimate prize going back to Sony. Also, as you pointed out, music publishing most likely will not remain as profitable as it was in the past, largely because the business has changed. In 1985, people still bought physical albums and singles, which is now being mostly phased out by streaming and digital sales-and we don’t yet know the full implications of these trends as potential business models (for example, most of the profit from streaming and digital sales is coming from singles rather than album sales). Also, as more artists begin exercising their option to have their publishing rights returned, as per the Copyright Act of 1976, that also would certainly have its impact on the catalog’s continued profitability. I didn’t know that McCartney had already initiated this process, but it certainly doesn’t surprise me. I would imagine, however, that music licensing will remain big business, as there is no shortage of demand for music in commercials, movies, and TV shows. The most troubling question that remains, I think, is that of the pending IRS case. A lot of fans are wondering if this sell out was a means of settling that debt. It is a justifiable question, given the close match of the sums. For that answer, we will simply have to wait and see how this plays out. i would also like to add that this sales is not a done deal yet,it still has to go through abitrattion and if the deal is not honestly it çould still be voided.besides katherine and mj3 i.e the kids could still raise objection over the sales. It is possible, although from a legal standpoint I think it is pretty much a done deal in all but the paper signing. Given recent statements, Katherine will most likely sign off on it. I don’t know about the kids. Paris has been pretty outspoken against Sony recently; if any objections are raised, it will most likely come from her. And she will be eighteen in just a couple of weeks. What I really want to know is how the exact formulation of this „buy-sell“ clause is. I only get explanations of the media or fans about this, but not the real part of the contract. Don’t we have to ask why Sony triggered it now and not in the years from 2006 – 2009, when Michael was still alive? He was in a stressed finacial situation in those last years, so he could have never be able, to buy out Sony’s share of the ATV back then. So if Sony triggered the clause in those years, they probably would have succeeded in getting the whole catalog. But they didn’t, and I ask why? Maybe the clause doesn’t explicit say, „you have to sell your half“ then the other party triggers it? For me it sounds like an odd clause when it gives one party the opportunity to just force the other party to sell at any point they want to aquire their half. It’s like extortion, because in case you don’t have the financal background you will lose your share. On that condition, Michael’s ATV share would have been at Sony’s mercy since 2006. And given all those facts, that Sony always wanted to get hold of the complete catalog, I just wonder, why they didn’t trigger the clause and get it back then. So I can’t help but think, that there’s a reason for them to do it now, because they (Sony) knew that they can get it from the Estate more easily than from Michael. But that would mean, that they couldn’t have forced Michael to sell, but negotiate with the Estate, or Branca, will finally proceed according to their plan – and it did. Yes, it definitely WOULD be interesting to see the exact terms of this contract. Unfortunately I, too, was only able to piece the story together from media accounts, which obviously do not give us the full story. But I think the knowledge Michael had that he had given Sony this leverage was a big part of his torment for the last three years or so of his life. From a rational standpoint, it had to have been. I agree that Sony would find dealing with the estate executors much more amicable than in the old days of dealing directly with Michael-for all the obvious reasons. As to why now in particular, however, it could be because of many reasons, not the least being that Michael died at the height of a great economic recession that we are only just now starting to come out of. I’m not sure if that could be a factor, but it would certainly be a plausible one from a business perspective. However, let’s not forget the conspiracy theories. Many still believe that the AEG concerts were just a thinly veiled cover to murder Michael and get the catalog back. At that time, the catalog was again put up as collateral, in the event the shows fell through (which they did). Many expected then that Sony would immediately swoop in for the kill. but when that didn’t happen right away and the estate maintained control of the asset, those suspicions were somewhat mollified (but never truly appeased). And a huge reason those doubts were never fully appeased was due to Branca’s obvious connections to Sony. It is still a tangled web that has bred much of the mistrust of the estate and their intentions, and certainly this latest development has done nothing to appease those concerns-if anything, it has only inflamed them. Thats interesting, because it means by triggering that clause Sony could only get one more quarter of Sony/ATV – but not necessarily Michael's whole share. (presumed the media report on this point is accurate). So with this clause, they possibly would have never gotten the whole thing while Michael was alive! Even if this clause really allows them to force him selling, it would have been only 25%. That could have been a factor for Sony to wait, either for Michael getting in more financial difficulties (maybe by not fulfilling his duties in the TII contract, for which the catalog was again put up as collateral, as you mentioned) or for someone else to negotiate, as it happened now. The whole thing seems to be so calculated. Raven, first of, happy to see your site back and kickstarted with another excellent article. Hope you are now well protected against hackers. What I will say has no legal standing whatsoever. It is just common sense and gut feeling. I also do not take seriously the self proclaimed oracles and “legal experts” of Michaels business affairs who deem anyone who criticizes the mismanagement of Michael estate as lacking business sense . Eventually much of what they say is worth just as much as any other opinion. Neverland and Michaels ATV share are not only symbolic assets. Neverland is cultural heritage, even black cultural heritage which is a rarety. Michales ATV catalog is an investment that sony would not buy if it was a burden to them. How come many fans predicted that it would happen . Yet a brilliant extremely well paid lawyer who happens to be the architect of the purchase of Neverland and the ATV catalog AND of Michaels will, let himself be surprised first by Colony Capital and now by sony with a clause that was triggered out of the blue ? The only justification for Branca to be back in Michaels life and unfortunately his death is because he was contracted by AEG for This is it, according to Randy Philips ‘because he knew where the bodies in sonys closet were buried’ And yet he did not know that this clause could be triggered? Can any legal expert explain what his self solicited position as a consultant for sony – outside the ATV board – really was in this game. No they cannnot, because if not for the leaked emails they would have ‘explained’ to us that no such thing would ever happen. Even if to Michael these were symbolic assets , it means that they represented more to him than monetary value . He was willing to do whatever it took to keep them and died trying. Now it feels even more that he died for nothing. Michael not only spent 47 mln on the purchase of the catalog, he also invested alot in expanding it and buying out Brancas share. I am disgusted by ‘fans’ who blame Michael for making debts while turning a blind eye on the executors created, totally unnneccesary , greed driven 730 million debt. My guess is that not the Colony Capital or sonys triggered clause, but the IRS looming claim forced the executors to make a move to secure the benificiaries inheritance and prevent the IRS from seizing it. The irony is that Branca had no intention to fund Katherine Jacksons trust. I am happy about two things, That Hayvenhurst is still in possesion of the family . And that Prince now has his own production company so that from now on no one including Branca can produce anything about Michael under their own name instead of under Michaels name and gather lifelong production rights with Michaels creative expression, that should have gone to the beneficiaries. And I think we will start to see both Prince and Paris taking a lot more active role in their father’s estate and affairs now that they are of age. Prince seems to have a good business head (albeit he is young and going through his “party phase” right now, but that will pass as he matures). I’m sure Branca was aware of the clause all this time. He would had to have been, as executor. He probably just didn’t know if or when Sony would make their move to buy out. You make a good point about fans and admirers owing it to Michael to not turn a blind eye to the management [or mismanagement] of his estate. Before reading your article I had reconciledmyself to it being none of my business. In other words, who am I? This is the Jackson family’s business. But, as I also posted on my Facebook timeline, this whole thing with the IRS is really suspicious to me and I haven’t been able to shake that feeling. It’s all to convenient. Whomever the executors used in the valuation of Michael’s worth made a huge mistake (whether accidentally or not) leading to the huge tax bill that opened the door for Sony to swoop in and grab the catalog that will generate millions for years to come, even without the Beatles. I just can’t get over how calculated this all appears. It is so troubling. I am not familar with the american justice and tax laws, but can´t the executors be hold responsible for the tax penalty, which is almost 200 m $ ? I hope the family sues them for the financial damage, they have done may it be intentionally or not ! The executors certainly can be held responsible by the beneficiaries. However, any and all penalties incurred by the IRS would still affect the decedent’s estate and assets, including the right to seize those assets. I would imagine in the event of a case actually going to trial against the executors, it would depend on the ruling, but I would need to do more research into it before saying with certainty. This is the main thing that troubles me about it, also. But the bottom line is that there is really only so much we can control as mere fans, and the rest is out of our hands. I want to continue celebrating Michael’s artistic legacy, and I don’t feel I can adequately do that if I allow myself to be over burdened by concerns over things that are out of my control, anyway. The financial affairs of his estate are something we can’t control, and it probably doesn’t pay in the long run to lose too much sleep over these things. But I always go back to the dream I had about Michael’s death and the suspicion that there is a lot more behind it than we know. There is still a part of me that feels we can’t truly move forward until/unless we have the full answers about why he died. I don’t dwell on it unduly, but it is always in the back of my mind. Branca was put in place to assist in stripping Michael of his assets. He probably figured that since seven years have passed, fans would not get nearly as upset if he had turned the catalog over to Sony immediately. Branca lost Neverland because he failed to keep up the mortgage payments, which is one of the primary responsibilities of an executor. He entered into unprofitable arrangements with Sony for This Is It, and with Cirque du Soleil, where the grosses are huge, but the estate realizes no profits. He turned over millions to AEG based on a fraudulent document prepared by a manager Michael had fired months before, and Frank Dileo, who was actually in AEG’s employ. I hope a judge puts a stop to this deal. The Jackson children should hire their own legal team and sue to stop it. Branca is either the world’s worst estate executor, or a crook. can someone please explain this IRS tax bill to me, if at the time of michael’s death even if the catalogue was worth 3billions dollars won’t michael’s share be 1.5billions and he has debt of 500mil on it does that not mean he actually is worth 1billion dollar before tax as at the time of death.Secondly according to the year-end estate financial report he was making between 17-23million dollars wish was used to pay down the debt.so how could the IRS Place a tax bill of 750mil on an estate worth 1billion dollars.when all the money that they were making was going to pay down the debt. 200mil of the 750 mil are penalties, not taxes ! The tax bill is a starting point. Competent executors would negotiate a settlement with the IRS for a much smaller figure. The key word is competent – Branca and Weitzman have been in negotiations with the IRS for some time, but as they have shown little regard for the Jackson children’s financial well being, and there are no fees to be realized for the executors, they might not be particularly effective. From media reports : IRS claims $505 million taxes, $197 million penalties, extra $30 million for gross undervaluation total $732 million. Jackson 5 masters 11, 2 vs 45. Whoever valued Michael’s assets for the IRS is trying – no doubt deliberately – to ignore the “Angel of Death” loophole in the tax law. If you’re not familiar, the AOD means that the estate should be taxed based on its value on June 25, 2009. All things Michael increased enormously in monetary value after his death, but for tax purposes, it doesn’t matter. The executors did a lousy job in their valuation, but the IRS is way off, too. While it was beyond price to us as fans, no way was Michael’s “image” worth $434, 000,000 on 6/25/2009. The IRS people seem to have been dazzled by the overwhelming world-wide reaction to the shock of his death. Considering that Branca sold Michael’s catalog for about half of its perceived value, the Jackson heirs have actually realized a loss. May I add, this is the first time the IRS has attempted to assess the value of the deceased’s image for the purpose of determining estate tax, which is patently unfair. No other celebrity’s heirs have been treated in this fashion. Only tangible assets have been taxed in the past. From what I understand the dispute is about the valuation of the intellectual property (Michaels own and his sony ATV catalog) which will be interesting now that it will be sold. But mostly it is about the (estate tax) value of Michaels image at the time of his death and what the valuation is based on. The difficulty is that like other unique assets ,(Neverland ,estate, art etc) image depends on the potential it has to generate money (when sold). It is absurd that the image of a man who was making a come back, sold out 50 concerts in no time, whose album sales had been steady even during the trials , who had many photo/fashion shoots in high end glossy and fashion magazines before he died , whose announcement of his concerts caused a frenzy all over the world, would be worth a measly 2000 dollars. I highly doubt that Branca would have inserted himself in This is it deal and ask AEG to be involved if he thought that Michaels earning/selling potential was that bad. If anyone knows how much Michael is worth, it would be him. The deals that spurred Michaels income after he died were all made before he died with the supposedly tarnished image, from This is it footage to Cirque and his own music. It was his image that triggered AEG to want to work with him. What is suspicious is that their low valuation of his image is supposedly based on the allegations and that just when the AEG case that would expose the IRS claim , was about to take off, out of the blue came Robson and Safechuck with their allegations. As someone else here said, it is all too calculated. But because it is also so transparant and we tend to only believe something if its complicated, it is hard for most people to phathom that this could be deliberate. Some say that the executors can be helt accountable for back taxes and penalties . But the way Michaels will is drafted, the executors have protected themself from all kind of liabilities. And start to think what a goldmine it is for a lawfirm to enter a years long battle with the IRS over an estate like Michaels. re my previous post : the 30 million extra was an omission on IRS side that they corrected. My point is that, for the purpose of determining estate tax, they should not have put a value on Michael’s image at all. Historically, the IRS has never taxed a celebrity’s image. When it comes to the Jackson estate, they’re just making up rules as they go along. It depends on provisions made in the will or trust. Provisions in a will or trust about exploitation of the deceased’s image have nothing to do with how the IRS determines how much is owed in estate tax, of at least it hadn’t until Michael died. If such usage results in income, then the heirs will pay income tax, which is not the same thing. Image and likeness are considered property and estate tax is a tax on property. Every individual or personality has a property right in the use of his or her name, voice, signature, photograph, or likeness. Such right exists in the name, voice, signature, photograph, or likeness of individuals or personalities deceased before, on, or after June 11, 1998. This right shall be freely transferable, assignable, and li-censable, in whole or in part, by any otherwise permissible form of inter vivos or testamentary transfer, including without limitation a will or other testamentary instru-ment, trust, contract, community property agreement, or cotenancy with survivorship provisions or payable-on-death provisions, whether the will or other testamentary instrument, trust, contract, community property agreement, or cotenancy document is entered into or executed before, on, or after June 11, 1998, by the deceased individual or personality or by any subsequent owner of the deceased individual’s or personality’s rights as recognized by this chapter; or, if none is applicable, then the owner of the rights shall be determined under the laws of intestate succession ap-plicable to interests in intangible personal property. The property right does not expi-re upon the death of the individual or personality, regardless of whether the law of the domicile, residence, or citizenship of the individual or personality at the time of death or otherwise recognizes a similar or identical property right. The right exists whether or not it was commercially exploited by the individual or the personality during the individual’s or the personality’s lifetime. The rights recognized under this chapter shall be deemed to have existed before June 11, 1998, and at the time of death of any deceased individual or personality or subsequent successor of their rights for the purpose of determining the person or persons entitled to these property rights as provided in RCW 63.60.030. Given society’s overwhelming fascination with celebrities, it may be of little surprise to learn that celebrities continue to earn money after they have passed away. While Elvis Presley topped the list for the second year in a row grossing $52 million,industry analysts predicted that Marilyn Monroe3 and James Dean—who generated $6.5 million and $5 million, respectively—have true staying power due to their “iconic fame” that has carried each through the decades. Although such right has not been implemented in federal law, a growing trend exists toward recognizing a postmortem right of publicity by statute or under common law. Sina, it held your comment in que because of the links. Sorry about that. I’ll catch up with the conversation soon. Yes, and that is a trend that will only continue to grow in this age of digital/CGI technology, holograms, etc. I really do not believe the estate was behind the Robson and Safechuck claims, although I have always suspected the timing of it just when the AEG trial was looming. But my suspicion has always been Wade’s connection to AEG. Would the estate have anything to gain by planting false allegations, and thus purposely lowering the earning potential of Michael’s music, brand and image? It would seem to me rather like someone shooting themselves in their own foot. But then, even Michael himself always had a suspicion that Sony was behind the allegations. The estimation of Michael’s image as being worth 2000 dollars was ridiculously low, and has never made sense to me. Like someone commented above, I will not be fully satisfied until we see what the contract actually said. I find it interesting that we have never seen that document, just like we haven’t gotten full details on the supposed options the Estate had that would make them the sole owner. I mean, they tell us everything else, but they can’t let us in on that? At this point, I’m not sure if that clause even exists in the contract, and I don’t believe they looked into any other possibilities for sole ownership. The whole idea from the get go was to get it into Sony’s hands. Sina, the IRS imposes Federal estate tax. The articles you cite refer to various state laws. For example, RCW is the Revised Code for the State of Washington, which has no connection to the IRC, the Internal Revenue Code. As Michael did not reside in the state of Washington, and apparently held no property there, their state laws do not apply to him. Washington is just as an example , check the CA link and everything else I sent you and read them in combination with the documents of the case that you can find on some fansites. Bottomline : Name and likeness are Property like other assets and represent taxable value . Why was Michaels set at 2000 for an artist of Michaels stature and does it make sense to blame it on a tarnished image /allegations , while there were so many who wanted to do business with him, including Branca, Colony Capital, AEG , Cirque and others, DESPITE the allegations. And why were his assets not protected under the will. There is some interesting discourse about valuation of image and likeness since Michaels case that you can google. Eta Estate tax is Federal , but not every state considers image as an asset or property , but California and some other states do. Raven, i thought i should bring to your attention this interview on MJCAST podcast concerning the Sony/Atv sale i thought was interesting,you should check it out. Raven, I don’t know how I missed this amazing post. Thank you for so clearly and compassionately articulating what the catalog meant to Michael and why the loss of it and Neverland meant so much to fans. This is the most level-headed and honest review of the situation I have seen to date. I also appreciate the discussion in the comments. You’re providing an incredible resource here for people who love Michael. “We can either expend a lot of energy ranting and raving, feeling angry and bitter over things we can’t control, or we can focus our energy on those positive things we can control. I will stress as I always have, that the best way we can move Michael’s legacy forward is twofold-to continue to celebrate his music (which will last forever) and to carry forth his work for the planet. Those are the only real certainties we have left, and in the grander scheme of things, perhaps all that truly matter. I love this, and I’d add that we all see different parts of the picture, and have access to different information. If we all do what we feel called to do, then eventually the truth will have to come out. I know very little about the estate and the catalog, but am grateful to you and everyone else who has worked on this issues. Again, my thanks. Thank you, Keely. I wrote that, really, out of a sense of helplessness about an action I disapprove of, obviously, but which I know I can’t change. In the long run, I do feel we can best serve Michael’s legacy by pushing forward.